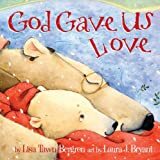 As Little Cub and Grampa Bear’s fishing adventure is interrupted by mischievous otters, the young polar bear begins to question why we must love others…even the seemingly unlovable. I adored this book. It was just a bit odd to place to I would read this. It was a board book yet it felt a bit in depth and long for board book readers. I’d pick it up – but I’d grab the hardback or the kindle version and share it with the elementary school set. I like it but agree that I think it’s for a slightly older child. yes, I wasn’t much up to the board book – but it was a great book.